A viral load is the amount of HIV virus in a sample of blood. Laboratories report viral loads as the number of HIV RNA copies per milliliter of blood. HIV attacks the immune system’s infection fighting cells known as CD4. 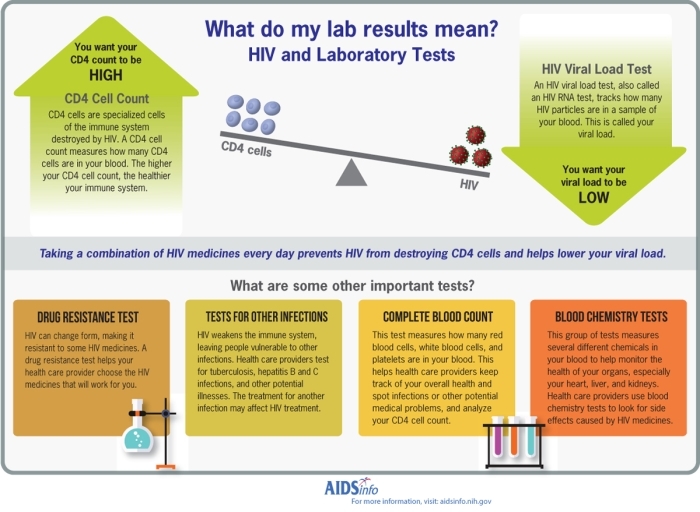 You can tell HIV progression through the CD4 count and viral load blood testing. The loss of CD4 count makes it difficult for a person’s body to fight infection. The goal of antiretroviral therapy is to suppress a person’s viral load down to an undetectable level and subsequently increase one’s CD4 count. An undetectable level is when HIV in the blood is too low to be detected with a viral load (HIV RNA) test. Even though a viral load may be undetectable, it does not mean that someone is cured of HIV. This is a lifelong virus and some of the virus can still remain inside cells and body tissue. » What is the difference between HIV and AIDS?